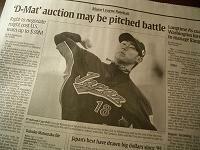 The posting right to negotiate Daisuke Matsuzaka might cost U.S.
major team up to $30 million. In 2000, Ichiro Suzuki’s posting fee was the highest as $13.1 million ever from Japan to MJB. BTW, I have been quite busy but enjoyed all days here in U.S. Many thanks for inviting dinner, Mr. & Mrs. Roth ! It was a wonderful night at Dudley’s.